SERVED: In its 4th season of air, Ugly Betty had a creative resurgence. I found myself each week excited to see what would happen to Marc, Wilhemina, Amanda, Daniel, Justin and even that drab whiner Betty. But when the fall season started, ABC clearly lacked faith in the show and placed it on Friday nights, aka the timeslot of death (RIP Dollhouse). 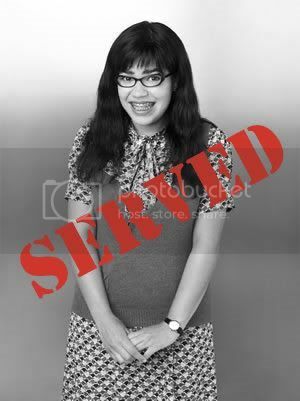 ABC smartened up and moved Ugly Betty to Wednesday nights in its new successful comedy block, but it was too late. It was announced this week that this season of Ugly Betty would be its last. SERVED. It's such a shame that a show with such talent and finally some good stories (and Betty finally got a makeover!) had to go out now especially with crappy shows like The Deep End still being on their line-up. Think someone should get SERVED? Leave your ideas in the comments section, email me, or hit me up on Twitter.